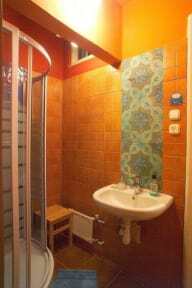 Brand new hostel, in the middle of the downtown, on the main boulevard of Budapest, everything is in walking distance! Brand new beds, sheets, bathrooms and toilets, huge kitchen, cozy common room with a game corner, free maps, towels, carpets...you will like it ! We offer huge deluxe rooms, comfortable new beds, 24/7 reception, lockers and reading lights in all of our rooms! Our staff is experienced in tourism, and always happy to inform you about the city, the country or almost anything you need. We can recommend the best places to go, local food+drinks, pubs and clubs. Hot shower in 4 bathrooms, free wifi+computer for internet, towels lent for free, huge collection of dvd's to watch and Playstation 3! Check in from 13 PM every day, 24 hours check out, however latest 11 AM on the day of departure. If you arrive earlier than check in time you are welcome to drop your bags but you have to wait until the person occupying your bed checks out at checkout time. Meet travellers, share the experiences about your travelling, destinations!